This state-of-the-art book provides a window on contemporary European entrepreneurship and small business research. 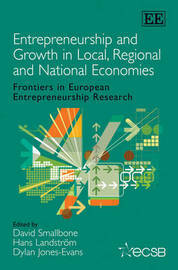 The papers selected demonstrate the applied nature of entrepreneurship research as well as the various contributions that entrepreneurship can make to local, regional and national development. Written by international experts, the book reveals the heterogeneity of entrepreneurship in terms of substantive content and the methodologies employed. With both quantitative and qualitative approaches well represented, Entrepreneurship and Growth in Local, Regional and National Economies covers topics such as regional perspectives on entrepreneurship, new venture creation and growth, business exits, knowledge-based entrepreneurship and social inclusion. Furnishing the reader with rich and leading entrepreneurship research, this book will be invaluable for entrepreneurship and small business researchers as well as postgraduate and advanced undergraduate students of entrepreneurship. Policy makers will also find much of great interest to them.